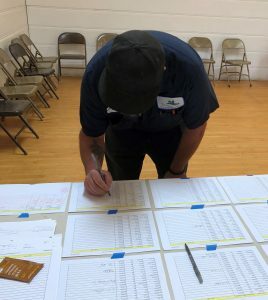 On Oct. 22, 2018, Local 1245 members from the City of Vallejo ratified a table agreement, with a 96% voting yes out of the 94 votes that were cast. The City Council subsequently adopted the agreement on Nov. 13. The two-year agreement, which was reached after seven months and 16 positive and productive bargaining sessions, includes general wages increases of 2.5% in the first full pay period following Council adoption, and another 2.5% in the first full pay period following January 1, 2019. Bargaining unit members who were employed by the city as of June 30, 2018, and continue to be employed during the first full pay period following Council adoption, will also receive a ratification bonus of $1,250. The agreement also provides for a guaranteed step increase if evaluations are not performed within 60 days of an employee’s anniversary date where a step increase was due. Bargaining unit members who participated in the Retirement Health Savings Plan (RHSP) while the City secured a third party account fund manager will receive a one time lump-sum contribution into their plan accounts. We also secured numerous non-economic improvements to contract language. The Local 1245 Negotiating Committee consisted of shop stewards Marcus Adams, Oni Brown, Dana Koutnik, Jorge Pamogas and Bill Stockman. We would also like to thank Election Judge Julie Bell, and Tellers Aaron Cano and Erica McCray-Hamilton.